PARIS—Jazz has always had more respect as an art form in Europe than in its home country, where appreciation too often gets tangled in the politics of race. We Want Miles: Jazz Face to Face With Its Legend is an extensive exhibition on the life and work of legendary Miles Davis at the Cité de la Musique in Paris. It offers the kind of loving attention that few jazz musicians, dead or alive, ever get in America. The exhibit, which opened on Oct. 16, closes on Jan. 17. Spread over nearly 9,000 square feet on two floors of the music museum, the show covers the full span of Davis’ artistic life, from rare photographs of him in childhood with his family and at age 16 in a St. Louis dance band, to soundtracks of his final recordings in the 1980s and several of the instruments he played. Davis’ role as a seminal player, creator and innovator in jazz are well-covered in this multimedia exhibit, which includes displays of instruments he played, scores from some of his most famous recordings, video and audio recordings, news clippings and reviews from both sides of the Atlantic. The Davis estate collaborated with the Cité de la Musique by making many of these items available. The display of musical scores is a refreshing break from the tendency among jazz chroniclers like Ken Burns to disregard the intellectual process involved in jazz and instead focus on personalities and pathology, like drug addiction. The scores, some by arranger Gil Evans, who collaborated on some of Miles’ most famous recordings (Birth of the Blues, Sketches of Spain) and others by Wayne Shorter, who played in the 1960s quintet with Tony Williams, Herbie Hancock and Ron Carter, are not particularly revealing. They are often sketchy, but serve as a reminder of the discipline and vast pool of formal knowledge that informs jazz. The show does a good job of tracking the evolution of Miles Davis, a musician who never compromised even as he sought to expand and escape the boundaries of jazz. There are photos and soundtracks from his role as a sideman with Billy Eckstine and Dizzy Gillespie; of his own early quintets with John Coltrane; and his score for Louis Malle’s 1958 film, L’ascenseur pour l’échaffaud (Elevator to the Gallows). The exhibit text explains the shifts in his music, from straight-ahead standards, to the big orchestral works, to his modal era, to jazz rock with Joe Zawinul and John McLaughlin and to his Afro-funk period with synthesizers and electric guitars. The exhibit uses an innovative approach. Some sections are decorated with newspaper and magazine front pages or antique radios that signal the era under scrutiny. The size of spaces vary widely, music from a relevant period often playing in the smaller, more enclosed spaces without interfering with different music playing in another section of the exhibit. You are also encouraged to plug in your own headset at different points to hear some of the music being discussed. The show doesn’t skirt the racial issues. It addresses the segregation of East St. Louis, where Miles grew up and the racial inequality he faced as a musician. There are striking front pages from the New York tabloids in 1959, showing a bloodied Miles, after he was struck by a policeman and arrested for ignoring an order to move along during a break while performing at a 52nd Street club. That photo was seen around the world, but few saw it inside the United States. 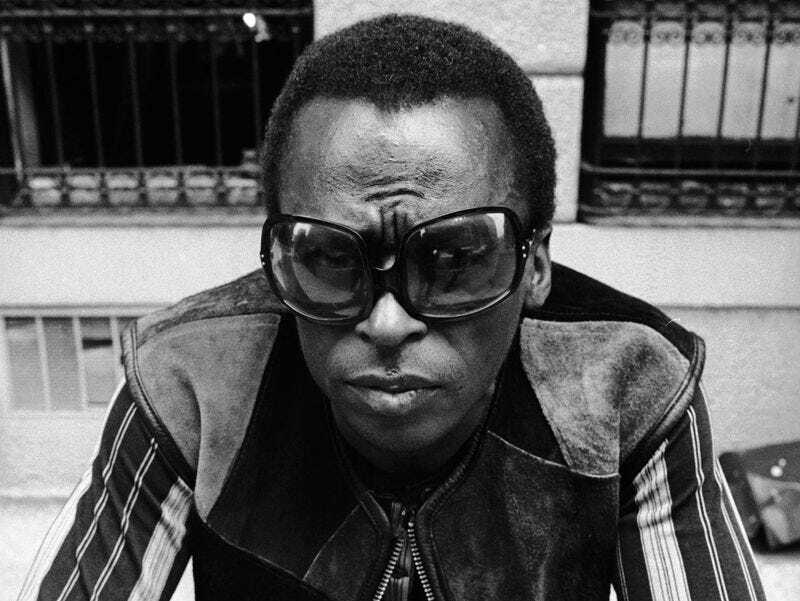 Miles’ fierce commitment to racial equality was not always so confrontational. After his record sales gave him considerable clout, he insisted that record companies put photos of pretty black women on his album covers instead of the generic white models that had long been the practice. Of course, many of the women were Miles’ wives or girlfriends, including singer Betty Mabry and actress Cicely Tyson. Considering his powerful racial pride, black visitors have found one item in the show jarring. It is a wish book by Baroness Pannonica de Konigswaerter, a Rothschild family member who was a patron to many jazz musicians, including Thelonious Monk and Charlie Parker. She had a habit of asking musicians to name their greatest wish. She would type out and paste the answer in the book. Her entry for Miles is: “to be white.” For those who knew Miles, the irony of his answer was probably lost. Fortunately, the details of his life and his fabulous music are not.